Details of agreement between Jewish Home-National Union and Otzma yehudit revealed. 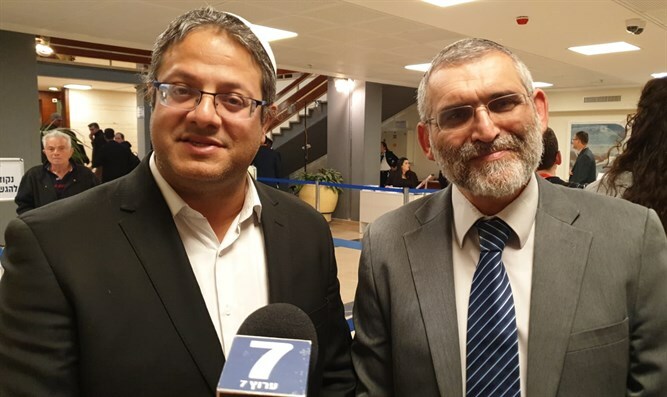 The chairman of the Central Elections Committee, Judge Hanan Melcer, on Tuesday ordered that all the agreements signed prior to the submission of Knesset lists composed of several parties be made public on the Committee’s website. "It is fitting that the future impact of political agreements will be taken into consideration by citizens during the vote," the judge ruled, even though such a duty is not stipulated in the law. Following the decision, the agreement between the Jewish Home-National Union and the Otzma Yehudit parties was revealed. The agreement was signed following Prime Minister Binyamin Netanyahu's pressure on the parties to unite. According to the agreement, immediately after the elections, the list will be split into two separate factions that will function separately during the tenure of the 21st Knesset. The agreement also stipulates that if the Jewish Home and National Union join the coalition and Otzma Yehudit remains in opposition, the Jewish Home and National Union factions will act so that a representative of Otzma Yehudit will be elected as a member of the Judicial Selection Committee on behalf of the opposition.